Seriously ... I had an empty wall in the kids/guest bathroom and needed something cool. Aussie scrap designer Rebekka Erickson (www.rebekkaerickson.com.au) had been kind enough to give Nan and I some of her product to use for Bind-it-All samples, so I took some of it and made this. Rodney even likes it, so I know it's a hit with the family! What do you think? 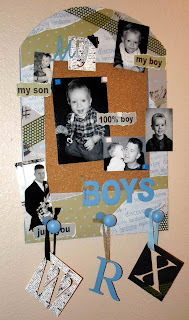 I got the cork board on clearance for $2.50 at JoAnns months ago and couldn't decide what to do with it. I knew I'd use it for something! Gotta love those clearance sales! Zutter Zisters has officially launched! 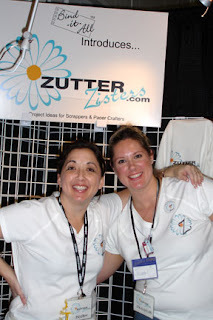 The Orange County Scrapbook Expo at the fairgrounds in Costa Mesa was Zutter Zisters' first event and our booth was one of the busiest! Here Nan and I are manning the booth's make and take, where croppers could learn how to use the Bind-it-All and DreamKuts. Wanna know more about these machines and what they can do? Click on my Zutter Zisters link! CKU Anaheim Registration begins March 14! 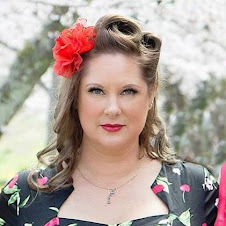 They haven't listed the classes or album tracks yet, but if you want to be immersed in all things croppy in mid-June, check out the details on www.creatingkeepsakes.com. Click on the CKU link on the left. Plus, I'm helping to organize the unofficial shopping bus tour that happens the day before CKU starts. Need details? Log on to the Yahoo Group called CKU Anaheim 2005 and see what's being said. Don't forget to add your name to the bus tour Database list, too! If you are interest in, or simply curious about, digital scrapbooking and mixing digital with traditional, check out the inaugural issue of Scrapbook Dimensions by visiting www.scrapbookdimensions.com and downloading the PDF. I've only had time time to flip through mine, but there was more than one thing that I bookmarked to read later! There are only two of these in the whole world and I painted them both. It only took 10 hours, but I'm hoping it will be worth it. Scrappy Nan and I are working to help market and demo the Bind-it-All and DreamKuts during it's launch into the scrapbook industry this spring. Zutter Zisters is one of the components (don't bother to go online quite yet, there's nothing on the web at that address yet, but there will be soon!) to help croppers get project ideas and supplies to use with their machines. Nan and I are INCREDIBLY excited about this new endeavor and are looking forward to sharing the benefits of these machines with others. Because first and foremost, these machines are FUN to use and open up so many new scrappy possibilities! I'm so excited! Learn all you need to know at www.crops2remember.com! As I was demonstrating the DreamKuts at CHA, I found myself making smaller and smaller rectangles if paper, using the back slot feature of the tool. This slot allows you to cut any width paper between 2 and 12 inches exactly in half. As I showed the intrigued crowds around the booth, I fought back the urge to drop everything, scoop up the tiny 1 x 2 inch pieces and immediately bind them into a mini mini-book. Instead, I waited until today to create the tiny wire-bound book of my dreams. With the help of the Bind-it-all (and the Bind-it-all's wire-bound catalog that was included - I used part of the 1/2-inch wire that held it together since I don;t have that size wire yet)I created a wearable scrapbook I was proud to show off. And it wasn't just because my husband and three boys were the subject, either! I was there and don't mess with my flair! "You are here" ... Yes I was there! The sign says it all! And I was there with my flair! Nan may tease that I required her to wear flair, but as any good "Office Space" disciple knows, you can't just have the minimum amount of flair! You must express yourself! And I expressed myself right into a sore neck! But now I have a rewarding amount of flair decorating my new scrap studio - the perfect thing for the skinny wall! Did I mention I went to CHA? Yeah, I'm up at 1:30 a.m. even though I'm exhausted. I'm still wired from a very "scrappy" week at CHA. Here are some of my favorite booths that were there - aside from Zutter's of course!!! 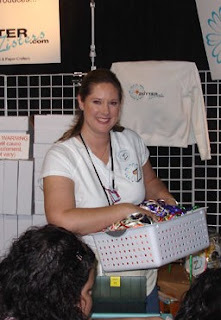 The Bind-it-All demo allowed me to meet some great people ... including Creating Keepsake's Scrapbooker of the Year, C.D. Muckosky. A delightful gal who brightened my day! I'm looking forward to seeing more of her work in the months to come! Also, editors and contributors from CK, Simple Scrapbooks, Scrapbooks Etc., the new Scrapbook Dimensions (for the hybrid digi and traditional scrapper), not to mention other reporters and columnists, stopped by to see what all the excitement was about. I wouldn't be surprised to see a lot of writing and blogging about Bind-it-All very soon!